A service dog strolls through the aisle inside a United Airlines plane at Newark Liberty International Airport while taking part in a training exercise, April 1, 2017. The merely ridiculous turned into the surreal recently when a New York woman showed up at the United Airlines counter in Newark Airport trying to check into her Los Angeles flight with Dexter, a peacock. The woman claimed he was her emotional support animal. United, sensibly, said no, and didn’t allow the bird on board. Coincidentally, the airline just released a new and tighter policy , joining Delta, which had already issued its own — and different — service and emotional support animals policy weeks before. While certainly well intentioned, the airlines’ new policies risk turning into a confusing patchwork. Clear industry-wide standards need to be set to protect people who really need animals and to protect others from a menagerie of pets that may pose dangers to both passengers and legitimate service dogs. The confusing rules currently in place have led to increasingly bizarre, and sometimes unsafe, incidents in the skies. Just ask Kristin Fleschner, a blind lawyer from Washington, D.C., who has traveled on more than 600 flights with Zoe, her 6-year-old guide dog. “One time, a dog was seated at the row behind us and barked at Zoe the entire two hours of the flight,” Fleschner said. Fleschner said it was deeply unsettling for her — and her fellow passengers — but Zoe slept at her feet, like she’s trained to do, the whole time. But that situation would unsettle a lot of guide dogs. “It would ruin them, and they would have to retire,” Fleschner said. 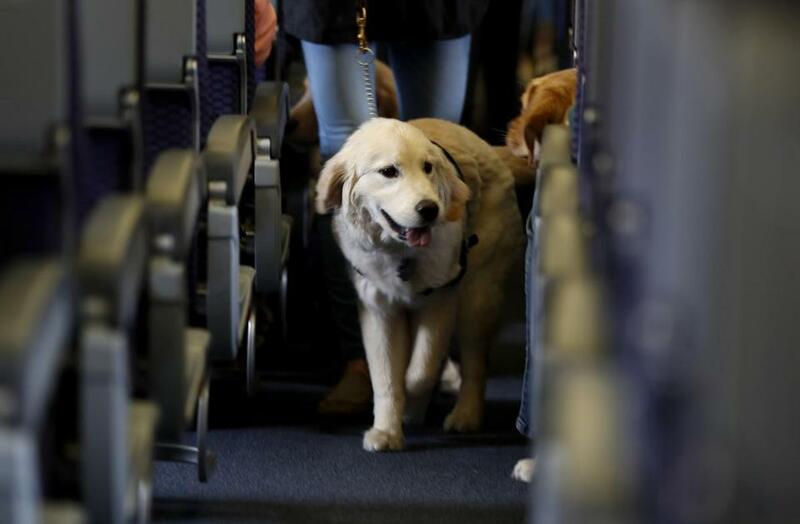 “People don’t realize that such an incident would change a blind person’s life.” And it goes without saying that poorly trained dogs that bark for a whole flight are annoyances, or worse, to other passengers. Owners of psychiatric service animals and so-called emotional-support animals will need to sign a statement vouching that their animal can behave. How did we get here? The problem stems from two differing federal laws governing public access in the air: the Air Carrier Access Act, which has allowed passengers to bring emotional support pets in the airplane cabin for free if they have a doctor’s letter, and the Americans with Disabilities Act, which only defines service animals as trained dogs or miniature horses. We’ve all seen, heard, smelled, or been mauled by the consequences. According to Delta, roughly 700 service or support animals fly daily on the airline’s planes — that’s 250,000 per year, and represents a 150 percent increase since 2015. Delta’s customers have tried to fly with emotional support turkeys, spiders, and gliding possums. Adverse animal incidents have increased as well, 84 percent since 2016. That includes urination and defecation, biting, and dangerous attacks. Last summer, a man was mauled by another passenger’s emotional support dog during boarding in Atlanta. Starting March 1, Delta will require documentation confirming the safety and necessity of the service or comfort animal; in the case of an emotional support pet, the owner must provide proof the animal is trained to behave without a kennel. Some disability access advocates have raised questions on Delta’s new policy, arguing it places undue new burdens on service animals and potentially violates the ADA. (“If you think that a person with a guide dog has an hour longer than the average person to stand in line at the airport, you are wrong,” said Fleschner.) United, which reported a 75 percent increase in comfort animals on flights, does make a distinction between service animals and comfort pets, tightening requirements only for the latter. Airlines should be lauded for trying, and states are doing their part, but real change is urgently needed at the federal level to resolve the apparent conflict between the two federal laws that address animals on planes. The US Department of Transportation tried to fine-tune the ACAA in 2016, but the months-long effort ended without an agreement on what types of animals should be allowed to fly and what documents are required to prove the animals are needed. This summer, the government will start taking public comments, presumably to try again. Clearer standards are needed now more than ever — unless travelers want to be stuck in the middle row between a possum and a peacock.